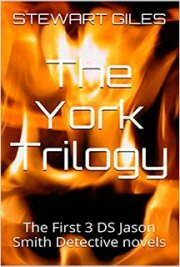 The York Trilogy. For the first time, the first three books in the DS Jason Smith detective thriller series, Smith, Boomerang and Ladybird are available in a single issue. Follow DS Smith as he travels from Australia to Yorkshire via Tenerife, Estonia, Vietnam and Singapore. From his early days In Western Australia to the historic city of York we see Smith fighting crime as only he can. Often naive, always stubborn, Smith will never give up until the case is closed. Surrounded by a team of detectives who don't always see eye to eye, Smith toils on regardless. In 'Smith', we see him emerge as a protagonist not without issues and demons from the past; 'Boomerang' sees him up against the evil Fulton twins and 'Ladybird' tests the very bounds of Smith's sanity.